BT Travel - another template tourism subjects. 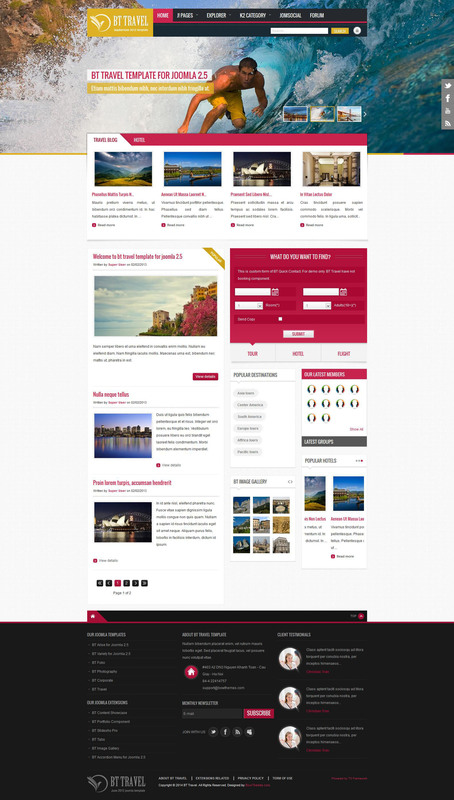 Its developers were members of the design studio BowThemes. The main advantage of this pattern is its versatility. This is manifested in its ability to develop the site to connect various extensions, starting on the basis of Kunena forum and ending with powerful component JomSocial, designed specifically for social networks. All this allows you to create using BT Travel Sites totally different themes and content. Based on the platform template T3 Framework V2 and meets all modern requirements sajtostroenija. Sites based on the work of the template BT Travel, displayed on all mobile and tablet devices and work correctly in all popular browsers.